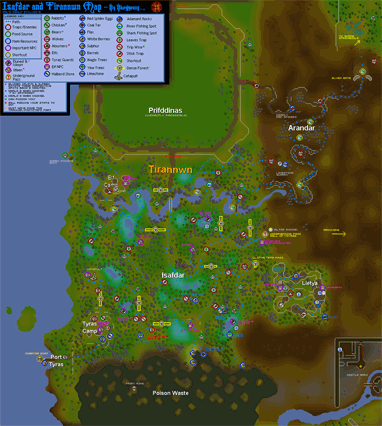 Welcome to Tyras Camp, a minor town in the southwestern corner of the Elvish land of Isafdar, located on RuneScape's most southwestern border. Tyras Camp is located in the southwest corner of Isafdar, the land of the Elves. The Elvish lands can be difficult to traverse, so a map of Isafdar may be useful to those traveling there on foot. However, the easiest way to reach Tyras Camp is simply by using a Charter Ship to sail directly to Port Tyras. From there, travel northeast along the road to reach Camp Tyras. To use this Charter Ship route, you must have completed the Regicide quest. 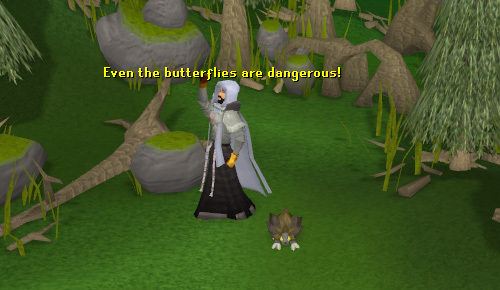 To get here you will need level 56 agility to climb through the dense forest in the background of the picture, and you need to have spoken to the Elf Tracker in the Regicide Quest. The first time you come here during the quest you'll be attacked by a level 110 Tyras Guard right here. Also be careful of the trip-wire traps slightly to the north-west. 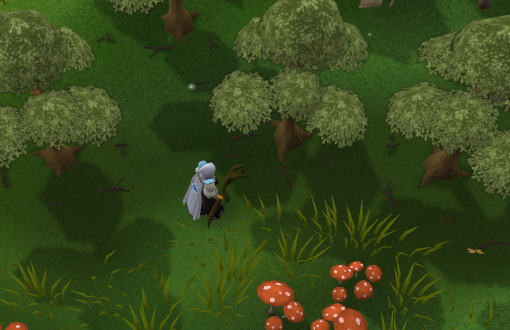 Here you'll find four yews, which are conveniently located miles away from the nearest bank. 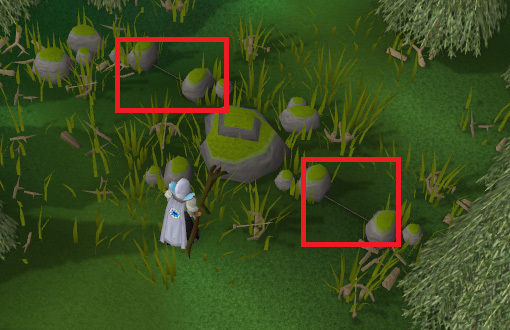 This is a good place for high-level Firemaking training, if you like doing that kind of thing. During the Regicide Quest you'll have to give the guard some cooked rabbit to take his attention off of the catapult. 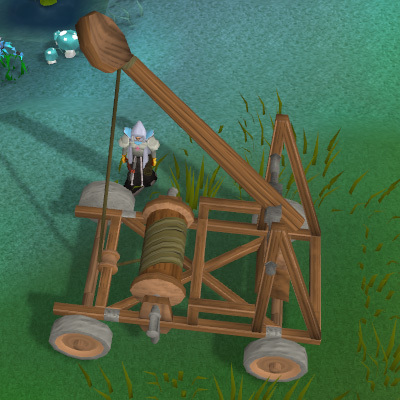 This is to give you the perfect opportunity at firing your barrel bomb into the camp to kill King Tyras. 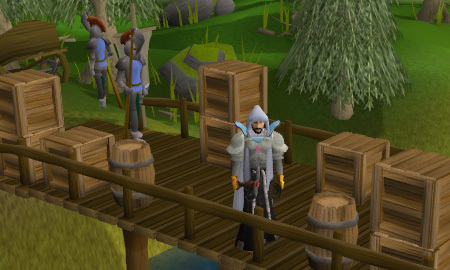 In the Catapult Construction quest, you will need to help the Tyras Guard repair the catapult. To get here climb through the dense forest south of the catapult. There are lots of level 110 Tyras Guards to kill, plus probably the least-used furnace of the world (chiefly used for making Quicklime in the Regicide Quest) and King Tyras' tent. After destroying it and in the act killing Tyras in the quest there will only be some charred ruins here, but later you will find it rebuilt and occupied by Tyras' second General Hinning. Next to it there's also a barrel respawn. If you would like some information on them I can tell you that Tyras is helping the rebel elves from Lletya to fight Lord Iowerth at the Elf Camp. There's also the legendary halberd shop here, just talk to the Quartermaster to access it. 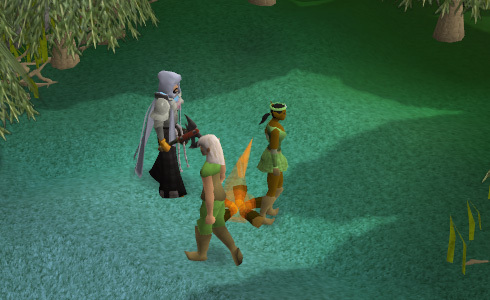 Note: The Dragon Halberd can only be bought and used after completing the Regicide quest. Here you'll find the roving elves Islwyn and Eluned. If you don't find anyone here just wait for a few minutes and they'll turn up. While they're there you'll also find a fire that doesn't go out. 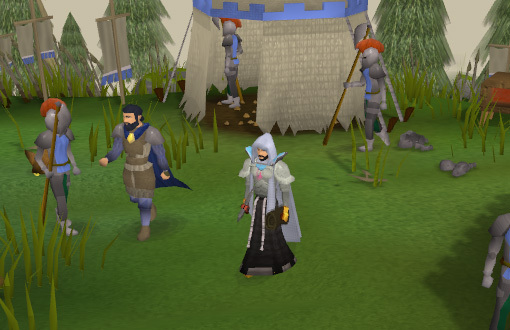 Islwyn will sell Crystal Seeds, Bows and Shields to you and is needed in the Roving Elves Quest. Eluned will recharge your Teleport Crystal for a price and is also the starting point of the Mourning's Ends Part I Quest. Toward the south of the Tyras Camp is a pathway leading to Port Tyras. Here at the port you can find Tyras Guards, along with Trader crewmembers, who run Charter Ship travel. 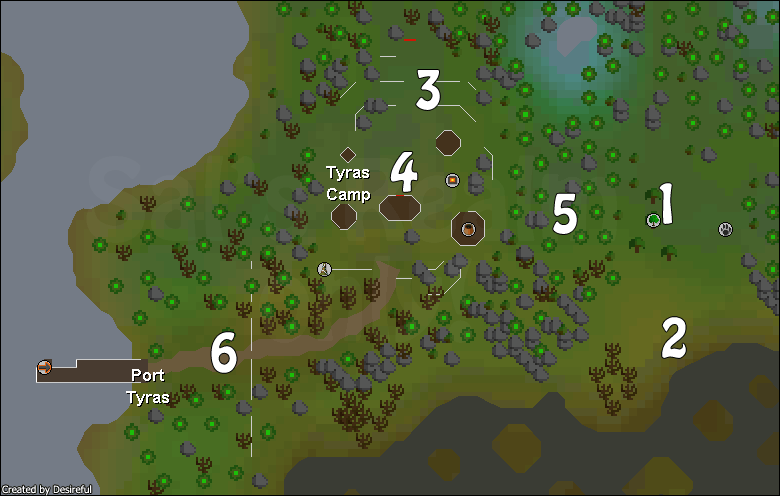 This is another way which you can enter Tyras Camp. To leave, you can charter the crewmembers and pay them a fee to travel to certain ports around RuneScape.